It begins with our commitment to our customers and focus toward continuous improvement through the practice of Kaizen; this is our chosen method for making fundamental and incremental change. It is immersed in the philosophy of Lean Manufacturing and total Customer Satisfaction. It is a never ending process of implementing our production system aligned with our Customer’s needs and expectations. The primary focus is on constructing and improving standard work to make our processes safe, repeatable, fast, and easy for our Team Members with little to no waste in the process. To do this we must spend our time on the shop floor (Gemba) observing and improving the seven flows. We must observe, look for waste and aggressively remove it. Then, we must do it again. Our production system not only aims to provide low costs, perfect quality with on-time delivery, it also is a system designed to reduce non value added support positions within the Company. This allows for a lower cost infrastructure supporting production. With no MRP or MPS (Push systems), we require no planners, production control, expediters or excessive inventory management systems. This reduces the need to have a large IT presence and ultimately lowers total overhead cost for the Company. The JIT function allows space and capital typically used for storage of inventory to add value by using it in producing products for our customers, rather than housing inventory to cover problems inherent with traditional production and inventory management systems. We hope we have done a good job sharing how our Company is aligned and focused on our Customer’s needs and expectations, we also hope you see value in what we do and how we do it. It’s our mission to exceed your expectations with lower cost perfect quality and shorter more flexible Lead-times while creating positive and successful business relationships. Our Team would like to thank you for your time taken visiting our website, we look forward to the opportunity to serve you. 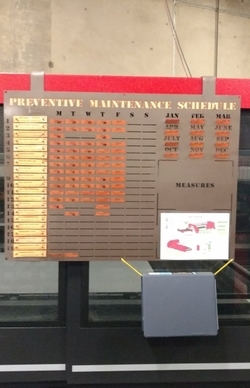 We are wrapping up a Kaizen event focused on preventative maintenance combining the Heijunka principles with our preventative maintenance scheduling. Now it’s simple to see what’s scheduled vs complete, and provides easy work instruction so most tasks can be completed by anyone on the team. Next the entire Company will be involved in value stream mapping exercise, this exercise is focused on helping us identify MUDA here and at the end user (our customer), we hope to reduce inventory here and at our customer’s point of use by 50% while implementing an auto replenish process that will introduce Heijunka level load signaling through the system. The ALM Team is currently participating in a weekly book review; this year we will be reading 4 books in an effort to continually improve our Lean application skills.